A condition in which the long-term force of the blood against the artery walls is high enough that it may lead to causing health problems as heart disease. Blood pressure is determined by both the amount of blood the heart pumps and the amount of resistance to blood flow in your arteries. The more blood your heart pumps and the narrower your arteries, the higher the blood pressure. Blood pressure measures two readings, one systolic (the highest point at which your heart beats, pumping blood back into the area where the blood pressure cuff is located) and diastolic (when you heart is at rest, causing a fall in blood pressure, indicated by the lower number). 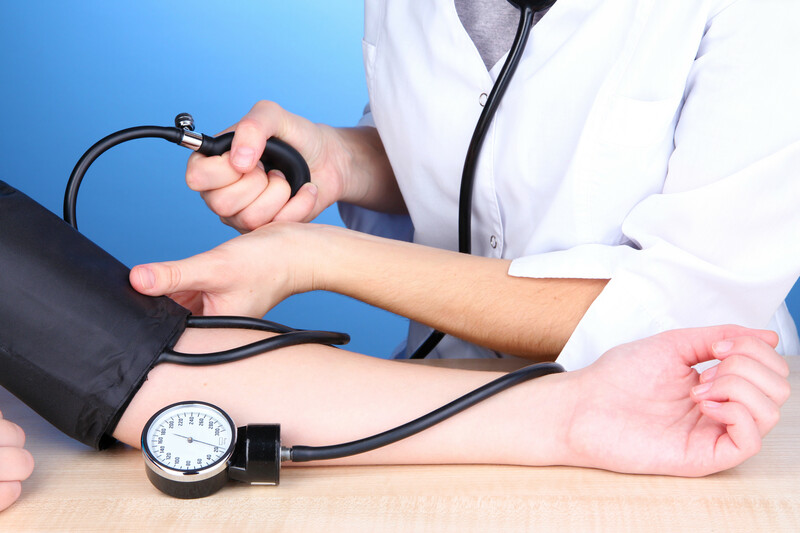 – Between 120-139 for the systolic number or between 80-89 for the diastolic number is called prehypertension. Prehypertension indicates progression to hypertension if you do no take steps to prevent it. Uncontrolled high blood pressure (hypertension) increases your risk of serious health problems, including heart attack and stroke. Fortunately, high blood pressure can be easily detected. Once you know you have it, you can work with your doctor to control it. Most individuals with high blood pressure have no signs or symptoms, even if blood pressure readings reach dangerously high levels. A few people with high blood pressure may have headaches, shortness of breath or nosebleeds, but these signs and symptoms are not specific and usually do not occur until high blood pressure has reached a severe or lifre-threatening stage. High blood pressure is one of the risk factors that can lead to heart attack/stroke and heart disease. For this reason, it is important to identify all and any areas contributing to high blood pressure. For this reason, we will take a thorough history, assess lifestyle habits that include diet, exercise, sleep, detoxification of the body, medications/supplements, mental/emotional state, stress and lab work to determine what is contributing to the increased risk, as well as the overall development of high blood pressure. Keep in mind that with any treatment option chosen to best fit your individual concerns, it will take time, constant effort and much dedication to helping reverse, regenerate and improve overall health. This will require a lifestyle shift. We cannot expect different results by continuing in the habits that led to increased risks and development of the disease in the first place. At the same time, together with Dr. Leah, you will achieve improved health and quality of life if it is what you desire.